Thank you for being patient this week while I wrote the week 5 post for our team blog! 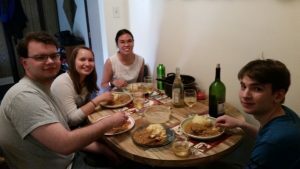 We left Accra on Sunday (August 5), and while the rest of the group spends a few weeks vacationing in Europe, I’ve been home unpacking, and fighting a “bug” that I picked up somewhere along the way. Anyway, on Monday we headed back to the dressmaker to pick up the dresses that we left with Nana. They all had longer zippers now, and fit really well when we got them home and tried them on. Emmanuel came by that evening to say his farewells, and to tell us that his driver would pick us up the next morning at 5am to bring us to Cape Coast. 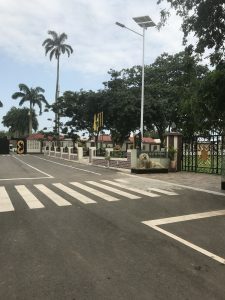 There is no direct bus to Cape Coast, and transferring buses can be a pain since they do not all have a set schedule (some of them leave as they fill). We got a group photo with him (below), along with some individual photos. We chatted for about ten minutes, and loaded the items that he stores for Pavlis groups into his car, too, before he drove off. An inventory of these items was taken so that we can give accurate information to next year’s Ghana group about what’s left for them. We left some cooking supplies including silverware, a hot plate, rice cooker, pan(s) and some dishes, along with 4 standing fans. These were left for us by last year’s group, and Nana and Emmanuel are nice enough to store them in their house for the groups each year. We finished up our packing that night and went to bed for a relatively long nap before our alarms started going off at 4am. We finished stuffing stuff into our suitcases (ie toothbrushes and PJs), picked up our bags, said our goodbyes to the hostel room, and headed out to meet the driver. The drive to Cape Coast wasn’t very long (about 5 hours), but it was quite bumpy. We made it to Cape Coast and finished checking in at the first hotel by 10:30am (Orange Beach Resort). We still had most of the day to explore the area and see what was around Cape Coast. We headed out going towards the Cape Coast Castle (though from my understanding, it’s being renamed the Cape Coast Dungeon, which might be a more accurate name). Being a tourist town, and the Dungeon a tourist attraction, there are plenty of people trying to get you to either buy their paintings and artwork, as well as children who want you to sponsor them in school. 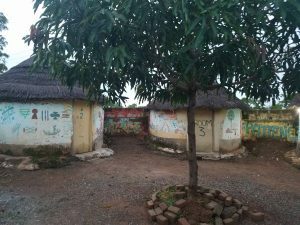 Our understanding from Nana is that school in free in Ghana, and the children all carried around copies of the same letter with their name filled in, so we were suspected that this money was not really for school. We weren’t warned about this, so we stopped and looked around at the paintings at the various stands, and had to resist purchasing all the paintings. I know that I spent more than I meant to at one of the shops, and had to be very conscious after that outing that this was a tourist destination, and just like any other major tourist area, there would be more than enough souvenirs around, and to resist the temptation to buy every single souvenir you see and like! And, like any other tourist area in the world, there are lots of people trying to make money from the tourists. This was also where a lot of Ghanaians want to be your friend. They want to know your name, and then want to know your number, or address. If you don’t want to give out your information, you have to stand your ground, make up a story if you have to (can’t get/make international calls), and eventually they will go away. You can also be more direct, and flat out say “no,” but I personally felt that they were harmless and 10-15 minutes later they’d go away if your “polite lie” was convincing enough. We spent a lot of time on the beach relaxing each day, though sitting on the beach and reading wasn’t an option if you were looking for a nice peaceful experience. Kids would come along asking you to sponsor them, or native Ghanaians would come asking you to be their friends. It was a bit easier to relax on the beach at our second hotel (Oasis Beach Resort). The group went out with Evans (staff at Orange Beach, not the same Evans from Babianeha), and another visitor from Norway the first night to the Dungeon. There was a lot of drumming that we could hear from the lounge area and even our room, and so we headed to the Dungeon (almost next door). It was the 20th anniversary of the emancipation of the Door of Return event. The Dungeon has a Door of No Return, which is the door that the slaves walked out of on their way to the ships that they were shipped out on. In 1998 the Door of No Return got a sign on the other side that reads “Door of Return.” At this ceremony, in ‘98 the bodies of two of the former slaves who had walked through the Door of No Return, returned home through the Door of Return. We stayed for most of the documentary (I think) before we headed home around 10pm. We headed back the next day for the official tour and to see the museum. The museum was really interesting; they had diagrams and illustrations of the ships and what the slaves had to endure during their time at the Dungeon. There were also photos of some famous African-Americans who are Heroes of Diaspora including Duke Ellington, Harriet Tubman, Fredrick Douglass, and Stevie Wonder, and Martin Luther King Jr. The tour itself was very eye opening. We were shown the various rooms where slaves were kept for months at a time. These rooms had no windows, usually 1-3 small holes (maybe the size of a window) at the top of one wall that had to be at least two stories high to let light and air in (for 250 men), and there were no bathrooms or latrines. We were also shown the rooms for the women and children over age 13, as well as the Door of No Return. It was hard to think about how those people had suffered. The next day (Thursday), we moved to the hotel next door (Oasis Beach). We took a trip to the ATM, and also gave Josh and Charles an opportunity to look at some of the shops for souvenirs. We spent a lot of the day relaxing on the beach, writing in journals and reading. 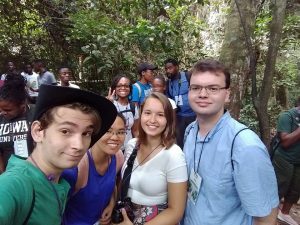 We took a trip to Kakum National Park on Friday to go on a canopy walk, which had been highly recommended by the previous group. The canopy walk itself was really fun, and the incline of the hill wasn’t bad, but the stones were not evenly laid, and you had to pay very close attention to your footing to make sure you didn’t slip and trip! 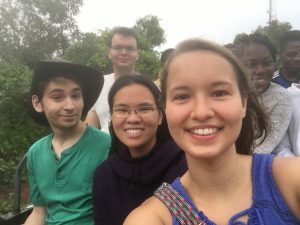 Charles took a group selfie (below), and Sonja captured a photo of Lianne and herself on the 2nd or 3rd suspension bridge. We enjoyed the rest of the day relaxing and packing up to head to Accra on Saturday morning. We didn’t realize that you had to pre-purchase tickets for the bus to Accra from Cape Coast, so we ended up taking a mini-bus (12 passenger van) to the outskirts of Accra where we picked up a taxi to take us to the Airport View Hotel. We spent most of Saturday relaxing at the hotel before our travel, and reshuffling some luggage. Sunday we checked out, and spent time in a lounge area working on our final project report before departing for the airport and our journeys to Europe and the States. Hello and welcome back to Team Ghana’s Travel Blog. This week has been incredibly busy, so let’s jump right in! We started the week off running, meeting with the headmistress of the basic school at UENR about a possible summer youth program on Monday. Also, our phone call and check in with our fabulous leader, Mary Raber, went very well. 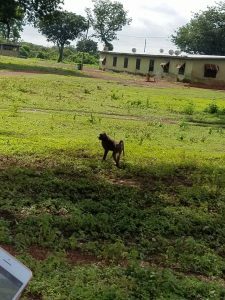 The team departed from our hostel in Sunyani early Tuesday morning and arrived in Babianeha just two hours later after a minor mixup with our taxi driver. From there we were greeted by our friend and guide, Evans, along with his “brother” Solomon who runs the community center. The women’s health workshop we put on in both Babienaha and Badukrom went so well that in the latter we had to bring in additional seating due to how many girls wanted to join in! After two amazing (and exhausting) workshops Team Ghana went back to the Opuni household and took a lunch of fish stew in tomato sauce before heading back out to Badukrom where we met the chief. He and his son, nicknamed Sacrifice, told us the story of how the town was founded by a man who was running from french slavers and ended up in Ghana. The people of Babienaha ended up giving him a plot of land as well as a kingship, and his descendants still live in the town to this very day. After out interview with the chief we said our tearful goodbyes to the people of Babienaha and returned home. After waking up so early to go to Babienaha, we thought our one meeting on Wednesday would be pretty easy and low intensity. It was not. We met with Charity, an african studies lecturer who was introduced to us by Dr. Asamoah at the University of Energy and Natural Resources. 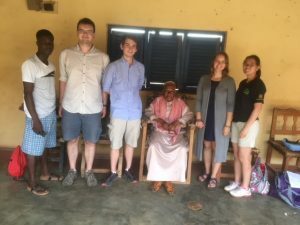 She lead us on a whirlwind talk, bouncing between different subjects like different Ghanaian customs or the English translations of some nearby villages, and even ended up introducing us to the people who ran the cultural center in Sunyani. While we got more than we bargained for, the team felt that the meeting was one of the most productive and thought provoking they had had thus far. Following the meeting, all who attended promptly took a nap for at least a couple hours. The following day, the boys became very ill but the girls continued to soldier on meeting with Dr. Phyllis Opare to discuss design thinking and STEM workshops. It turns out UENR already had a STEM fair in the spring semester but they were open to the idea of collaborating with us to do one in the summer! Sonja continued being awesome that night, frying up yams that we had bought in the market to make delicious yam fries which were heartily eaten by all. On Friday we picked up the gorgeous hand-tailored Ghanaian outfits we had ordered the previous week. Everyone was super pleased with how their outfits looked, but less pleased on how they fit. Sonja even had to cut herself out of her dress with a pair of scissors and Lianne couldn’t even put hers on. Never fear though, they’ll be sent back to the tailor and all will be well. Additionally, we found out how to make dough for Buflot, a kind of Ghanaian donut. Nana, one our hosts, taught us along with her extended family. We’ll have to try making some when we get back to the states! 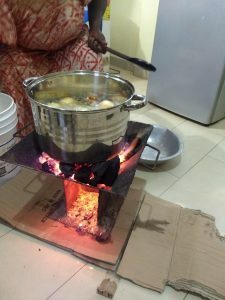 On Saturday morning, we made the early trek to see the Buflot being fried, which was done in the kitchen on a charcoal oven. The Buflot themselves were too hot to eat there, and had to cool while we met with Prince Bonnah Marfo at the cultural center. At the cultural center we learned how the center uses the power of theatre to teach lessons and bring about social change through what was basically human centered design. They were also very excited about the village name project and were willing to turn the stories into radio plays or even ones on stage. Sunday was our day of rest from our long, eventful week. We washed clothes, wrote in our journals and generally took stock before our long trip on Tuesday of the next week. It’s so odd to see how much of your life can fit into a couple bags, and it’s hard to believe that we’ve been here four weeks. 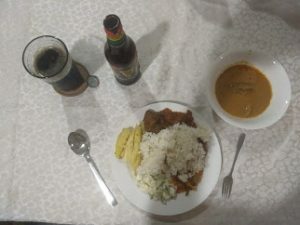 Nana and Emmanuel also had us over for a Ghanaian feast at their home, with groundnut and tomato soups, fried chicken, plantains and yams, as well as egg salad and rice. It was some of the most delicious food we had eaten all month. Literally everything was cooked to perfection and every single plate was practically licked clean. In addition to eating amazing food, it was fun to see Emmanuel and Nanas family as well as just hanging out with them. We talked late into the night, talking about Michigan Tech, Russia and plans for the future, and we were all really sad to leave at the end of the night. That’s all for this week, keep watching for next week’s report. We’ll be in Cape coast touring slave dungeons and hanging out on the beach! Our focus for this past week was on ensuring the sustainability of the projects that we are introducing and continuing. In short, we wanted to make sure that the projects that we are working on could be continued without our direct presence. This was also the week that we went to Mole National Park (pronounced like the end of guacamole) for a safari. The main project that we wanted to look at the sustainability of is the women’s health project that has been run for the last several years. 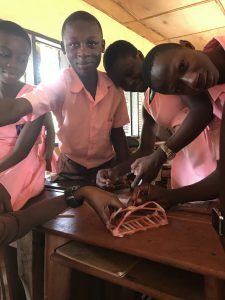 The project teaches girls how to create reusable sanitary pads out of fabric so they don’t need to resort to makeshift alternatives like parts of old mattresses. 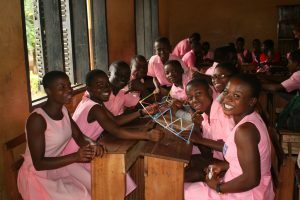 Typically, the girls have been supplied with kits containing enough material to create three reusable pads with the hope that they would be able to create more as needed. 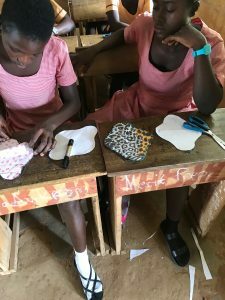 Ideally, the girls would also be teaching their friends and family how to create the pads so that the knowledge can be spread to people that we can’t reach during our time here. In order to make sure that this is possible we needed to make sure that the fabric that we provide, fleece and flannel, is able to be found in the markets in Ghana. If they are not, we wanted to try and find alternatives that the girls would be able to get ahold of and use. To find out what materials were available to the girls, we went to the markets in Sunyani. It was not the first time that we had been to the market but we had not really looked for these sort of fabrics before so we were not entirely sure what we would find. The group started at the Wednesday Market, which true to its name is a market that only gets together on Wednesdays. We had been there only once before, during our first week, so it was fairly easy for us to get turned around and lost outside of the Wednesday Market on the streets of Sunyani. It was during this time that we got a bit of a lucky break. In a roadside stall not far from the market we found fleece blankets that could be used as material for the kits. We bought a few to supplement the fabric that we had brought and figured that if we could find them at a random stall outside of the market, then someone who knew the area better could probably find some as well. As we continued to try and find our way back to a familiar area, we saw several more stalls selling fleece so we felt confident in this choice of fabric. 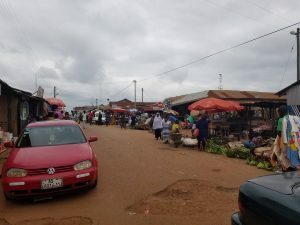 Our wanderings eventually lead us to a part of Sunyani that we were much more familiar with, the area outside of Sunyani’s Central Market. The Central Market is in full force everyday, so we go there fairly often to get food and other necessities. We managed to find a few more stalls selling fleece and visited a fabric store that Nana had shown us earlier in the week when we went shopping for African fabrics we are getting tailored into clothes for us. We were unable to find flannel, but Lianne felt confident that by layering cotton, which is by far the most common fabric we found, that the same effect could be reached. Of course, we also worked towards sustainability in other projects. We found local technology shops that we are planning on checking out to see what future groups may be able to buy over here instead of bringing from the US. Charles and Josh met with a contact at the University of Energy and Natural Resources (UENR) who was able to put us in touch with more people who should be able to help with the folklore project. 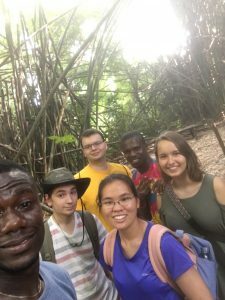 While this was going on, Sonja and Lianne were meeting with Dr. Emmanuel Opuni-Frimpong, our main contact and the Pro-Vice Chancellor of UENR, to look into bringing a Summer Youth Program to UENR, similar to the one at Michigan Tech. 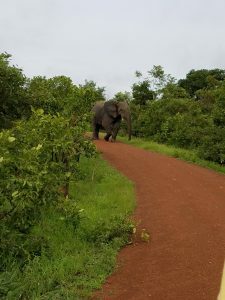 By far, the highlight of this week was the trip up to Mole National Park for a safari. We went up on Friday with a driver that Emmanuel knew and stayed the night at the Savanna Lodge in the village of Larabanga. The Lodge was great and it was as close to the park was we could stay without staying at one of the hotels inside the park (which were all full). The next morning we got up bright and early for a 7AM safari. The safari lasted about two hours and gave us the opportunity to see lots of animals in their natural habitat. 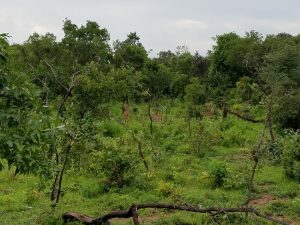 Among the animals we saw were elephants, warthog, kob (a type of antelope), and monkeys along with a wide variety of insects, lizards, and birds. I could spend pages writing about everything we saw, but a picture is worth a thousand words. We had a fantastic time this week, and we look forward to what our final couple of weeks in Ghana have in store for us. “Broni Coco Machi!” means “Good Morning, White Person!” in Twi. During our time in Babianeha this week, children were constantly singing this to us. Everywhere we went, kids were singing and waving at us. I felt like a huge celebrity everywhere we went! I never thought our mere presence could make them so happy. I had so much fun waving back at them and shaking their hands. I just wish I knew more Twi, so I could interact with them more. This was the case in Sunyani too, but they liked practicing their English with us more than their Twi. Whenever we visited the school there, they would also stand up and say, “Good Morning. I am fine. How are you?” in unison. And so many of them wanted to shake our hands and take selfies. It was really cool! Besides being paraded around the town and waving at children, we did get to do some actual project work this past week. 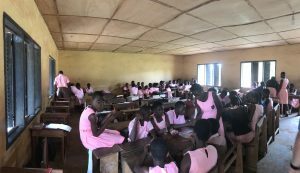 On Monday and Tuesday, we visited Ridge Experimental School B in Sunyani, where we conducted a hand washing demonstration, a women’s health workshop, and a STEM education demonstration. During the hand washing demonstration, we taught the children in all grades the importance of hand washing and how easily germs can spread. Lianne did this by squirting some liquid soap in a few kids’ hands and having them shake hands with their fellow classmates. They all laughed as they had to interact with each other and make everyone’s hands sticky. Fletcher, the ICT coordinator at the school, walked around with us and asked the kids questions to make sure they were paying attention. Whenever he asked what they learned and only one person would answer, he commonly said, “Who is coming?! They have not said all. You’re being selfish with your knowledge!” We laughed about his word choices later because we were so shocked by them, but we were still extremely grateful for Fletcher’s presence. Although through unusual methods, he still made sure the kids were listening and engaged in the demonstration. During the women’s health workshops, Lianne and I helped about 50 girls learn how to make reusable sanitary pads with some kits she made. They also liked to laugh a lot and work together. Two of the female teachers even helped us out with instructing them. One teacher would repeat what we were saying to the kids in Twi, and the other teach made sure to take selfies with us while we were instructing! I thought it was hilarious, but she did end up helping girls make their kits too. 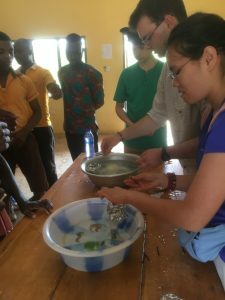 Josh worked with the kids on STEM demonstrations both in Sunyani and Babianeha. 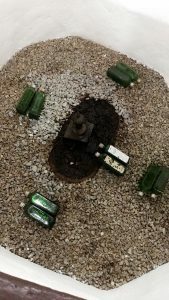 He had the kids work on their creative and designing skills by building small boats with aluminum foil and having them test them in a couple basins of water. The boats were supposed to be designed to hold a large load without sinking. This was tested by adding nails to the boats. Some sank with one nail, and others couldn’t be sunk by even 25 nails! All of the kids had a blast doing it. They’d egg each other on about their boat designs and boast to each other if their boats held more nails. The teachers in Babianeha were especially enthusiastic about the project since it related directly to what they were teaching at the time. They helped us out even further by tying it to their lessons on buoyancy and upward and downward forces. I just wish we had more time in the schools and more demonstrations to do. The way all of their eyes lit up made you really feel like you were making a positive impact in their lives. During our time in Babianeha, we also had time to talk to the directors of the community center, which is basically a computer lab for the students. It was fun getting to know the uses of the community center and learning about their needs. It was crazy to realize how much we take for granted something as simple as a printer in the United States. My goal is to find a sustainable way to make sure they can access the resources they need in order to give the kids at the school a great education. After visiting the community center, we met with the headmaster of the primary school. We discussed the needs of the school, and it was great to learn that he would also like us to do STEM demonstrations with the primary school students. 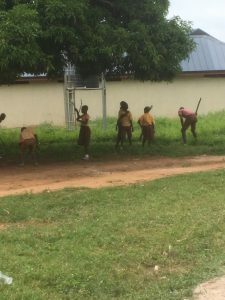 At this time, I also noticed all of the kids were outside with machetes chopping the grass! I thought it was so unusual, but the headmaster explained that because of the uneven layout of the land, they can’t use lawnmowers to keep the grass cut. I guess if it works, it’s fine, right?! Later that day, we spent some time working on Charles’ project. We headed out to the monkey sanctuary close by. 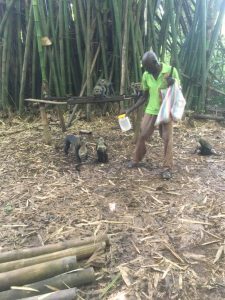 His goal was to gather some stories about the place and the monkeys themselves. When we arrived, the place was much different that I had expected. I pictured a tourist town, but it was actually a small village. 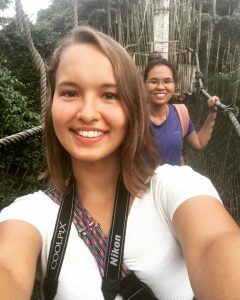 When we arrived, we met with an old man who agreed to take us out to the forest to see the monkeys. And boy did they not disappoint! There were monkeys everywhere! There were many times where we got so close that we could touch them. We brought bananas with us, and the man had some dried corn in a jar he could shake around to attract the monkeys. He let us feed them the bananas and corn, and it was so cool! We even saw baby monkeys clinging to their mothers! This man also only spoke Twi, but we luckily had Evans and Solomon there to translate for us. He explained to us how monkeys were very sacred to their community. In fact, they were given the same respect as humans. If anyone killed a monkey, they would also die for their crime, and the monkey would be given human burial rites. We even passed by one of the graves on our way through the forest. We also learned about how the town came to be, but that’s a story for another time. Charles plans to post a collection of the stories we learned later on. The next day, we went to the Chief’s Council Meeting. Unfortunately, the Chief couldn’t be there since he was away in Accra at the time. But meeting with the Council was still a really cool experience. Charles asked them for stories about how the town came to be and other folklore they may have stored away. 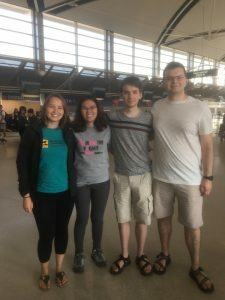 I asked them about any needs they had within the community and if there were any projects they’d be interested in partnering with Michigan Tech on in future years. They talked for a little bit in Twi and Monaa, and they decided that they’ll give us a document with the information we seek in two weeks. It wasn’t how we expected it to go, but I think it still worked out well! We were all really nervous coming to the meeting since we didn’t realize how many people would be there or all of the formalities we would have to go through. It definitely made me more nervous about it since I didn’t want to accidentally offend anyone, especially in this context. We were in the presence of some of the most respected elders in the community! I can’t even imagine how much of a disaster accidentally disrespecting them would be. Overall, our week spent at Ridge Experimental Schools and in Babianeha were very eye opening and successful. We would especially like to thank the Opuni family for hosting us. They gave us a place to stay and cooked meals for us every day! 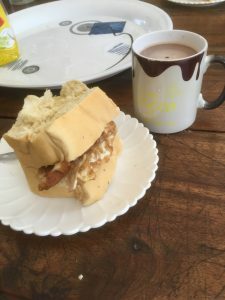 My favorite meal was always breakfast since Evans’ mom would make us a breakfast sandwich and milo (basically hot chocolate). We would also really like to thank Evans for carting us around everywhere and putting us in contact with people. We would have been so lost without him! Medase! Thank you for following our journey. We’ll have more updates next week! We left the USA on July 1 flying out of Detroit with a layover in New York (JFK). We got into Accra on Monday morning at about 8am. The plane deplaned from both the front door and back door in Accra. Customs was a breeze, and Andrew met us once we got our bags and were through customs. Accra is a beautiful city and is the capital of Ghana. We stayed at the Airport View hotel which was about a five minute ride from the airport. Andrew took us to the Accra Mall, which is just like any mall in the States. We got cheap Ghanaian cell phones (think a basic phone from around 2003), exchanged money, and had lunch at a local “chain” fast-food type restaurant. They serve various chicken meals, some of them come with rice, and bottled soda. The hotel is beautiful, and the staff was wonderful. We were able to meet with one of Sonja’s contacts, Akwesi, in the afternoon. 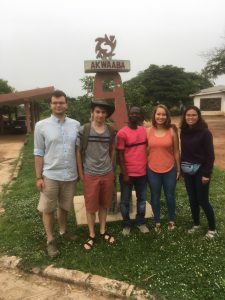 He is actually moving to the States in August, but he was able to connect us with some other people at KNUST who could talk to her more about biomedical engineering projects that future Pavlis students could work on. We all watched one of the World Cup games and had dinner at the hotel’s restaurant buffet. The hotel also had a breakfast buffet which had rice and little sausages at it, as well as fresh fruits and vegetables. We took one of the hotel’s vans to the VIP bus station where we were able to catch a bus to Sunyani. The seats were huge, and some reclined (others no longer worked); it was like “the old” First Class. The traffic in Kumasi is very heavy. It’s like getting around Chicago, but on surface roads; there are no interstates. 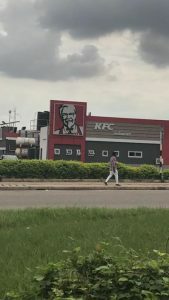 We went through Kumasi, stopping at a gas station that was attached to a KFC (yes, I mean Kentucky Fried Chicken is sold in Kumasi!). Every town and village has speed bumps as a way of controlling the speed limit. Some of these bumps are massive, while other villages have 3 bumps in a row. Each town/village has multiple speed bump locations. I think we all thought that the bus ride was bumpy, but our view of “bumpy” would change the next day. Nana (Emmanuel’s wife) met us at the bus station in Sunyani and helped us move into our hostel room. We’re on the 4th floor, and have 2 rooms with a shared bathroom at the back of the hallway. We went to the Eusbett hotel, where Andrew is staying to have dinner with him and Nana; Emmanuel was out of town that night, so we weren’t able to meet him. Our group got a Hawaiian pizza, and most of the group tried some Ghanaian beer. Drinking age is 18 here, and it amazes me that nobody that orders beer is asked for some ID. The next day we ate breakfast at the Eusbett hotel, met Emmanuel’s nephew (also named Emmanuel), and then took a taxi to the Wednesday Market (it’s insanely busy!) to catch a tro-tro going to Dorma, a little town (or village?) about 20 minutes away from Babianeha. The tro-tro is an old 15 passenger van, and they stuff as many people in one row as possible (this can mean 14-18 people). Since the van is old, and has now been a tro-tro for a while, it has virtually no suspension, so you feel every pothole, and speed bump. The visit in Babianeha itself was very nice. 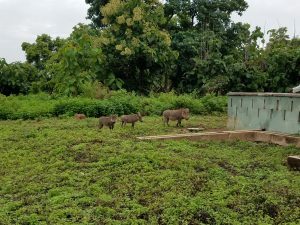 We were able to meet Emmanuel’s extended family, and some of them showed us around the village, and helped us (legally) cross in to Cote d’Ivoire. 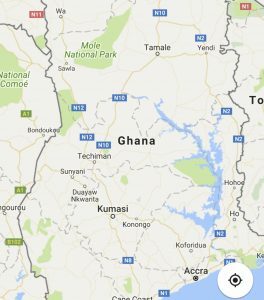 The town Gronnokron is a little town that straddles the border with Ghana. 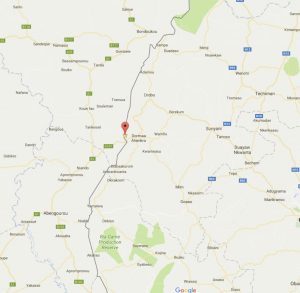 You can visit the town without having to go through Cote d’Ivoire customs. We also met some of the teachers at the school. The school kids got very excited to see “Obrunis” (aka not Ghanaians). We ended up getting snacks on the way out of town since we missed lunch, and then caught a bus to Dorma, and tro-tro back to Sunyani. After we washed up, we returned to the Eusbett for dinner, and got to meet Emmanuel (Nana’s husband). It was the 4th of July (American Independence Day). Thursday, we stayed in Sunyani. We were able to meet up with Emmanuel (Nana’s husband), and he took us to the Ridge Experimental School (one of the schools that Josh will be doing a workshop at). We also went to the Central Market to purchase some items that we needed for the hostel. We got some bottled water, toilet paper, rice, onions, garlic, soap, and clothes pins. 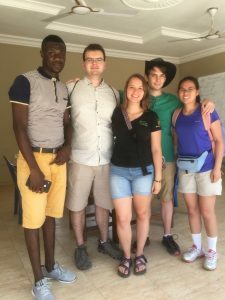 We went to Kumasi on Friday, where we said goodbye to Andrew, and met with Josephine, Isaac and Solomon, and Dr. Ahmed at KNUST. Akwesi knew Josephine and connected Sonja with her. 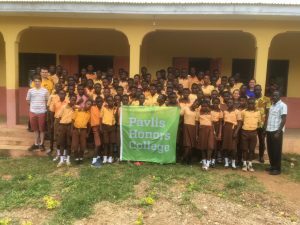 Sonja and Andrew were able to talk to them about the possibility of future Pavlis students collaborating with KNUST for biomedical engineering projects, and what this would mean for both Tech and KNUST. After we were done with our meeting, we said goodbye to Andrew and he departed for the VIP bus station to catch a bus back to Accra. The students took us around campus, showing us different buildings, and the ventilator that Akwesi and previous Pavlis students worked on. They took us to a little café on campus called Icy Cup and treated us to yogurt smoothies. Once we wrapped up at KNUST, Emmanuel’s driver drove us back home. Traffic was insane in Kumasi (of course), and I’ve noticed that checking your blind spots or mirrors is a foreign idea in Ghana. When we got home Charles and Josh made us dinner from the bell peppers, onions and rice that we bought at the market. Yesterday (Saturday) we went to Melcom, a Walmart like store in the middle of Sunyani. We purchased some packaged food (like Pringles) and also got some household items that we couldn’t find (or forgot to get) at the market. We all kind of expected to walk into a Walmart, so I think we were all a little surprised when we found out that the store is 3 or 4 levels high, and doesn’t have a very big floorplan. 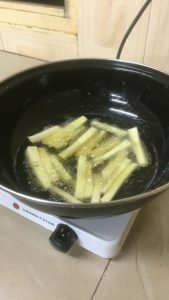 In the evening, Emmanuel came over and taught us how to make fried yam. He brought some fish and tomato sauce that we could use with the fried yam, which were thick and crunchy. He also boiled some of the yam, too, which was kind of like eating a baked potato. Next week we are hoping to do a few Women’s Health and STEM workshops at the Ridge Experimental School here in Sunyani, as well as travel to Babianeha for a few days where we will also do a few workshops and stay with Emmanuel’s extended family. Thank you for following our journey so far! This post was a team effort! We each wrote our own biography, and Charles wrote the first part of the post. Lianne wrote the second part about our team activities. We all look forward to contributing to the blog while we are in Ghana next month. 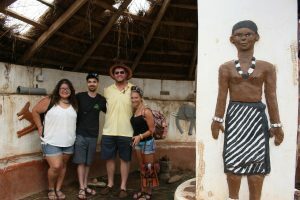 Me kyea mo [I greet you] and welcome to the first travel blog of Team Ghana. Seeing as we are still a ways away from officially beginning our journey in country, we’ll start with a brief crash-course in Ghanaian history, as well the backgrounds of the team members and what projects they will be heading up in the future. The modern state of Ghana has its roots in the 9th century, as a local trade powerhouse and continued to hold a place of power within the region until the advent of european colonization in the 1500’s. After the end of the second world war, the political landscape was in constant upheaval, transitioning from a constitutional republic to military junta and back again until the turn of the 21st century. Today Ghana is one of the fastest growing economies on the continent, with an 8.7% GDP growth and one of Africa’s largest stock exchanges. Additionally the country boasts a multicultural populace, with a mix of ethnic groups such as the Guan, Akan and Ashanti residing within the borders of the country. The region in which we’ll be operating out of will be in the Brong-Ahafo Region, which is mainly populated by the Akan people who speak the Twi [Ch-wi] language. 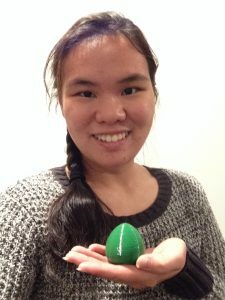 My name is Lianne Novak, and I’m going into my fourth year at Michigan Tech (fall 2018), and am a general mathematics major, looking to complete minors in statistics and Leadership (through the Pavlis Honors College). Outside of academics, I’m involved with the Huskies Pep Band and am a tour guide through the Admission’s Office. I enjoy watching Huskies volleyball and hockey, snowshoeing (in the winter) and enjoying coffee at Biggby, or Pannakaku at Suomi’s with friends. I’m organizing and planning the Women’s Health project. It’s centered around teaching girls in some of the communities to make reusable sanipads. Girls in past years have had to miss school every month, simply because they don’t have access to any sanitary products. We use materials that the girls can get in country, and will be giving them a kit for the workshop, but they can keep the extra materials (sewing needles, scissors, and possibly extra fabric if I can purchase enough for two pads/ girl). Also, in the past the girls have learned how handwashing and sanitation is important. I am going to try and expand this portion of the workshop this year. Thinking about going to graduate school in Biostatistics, I took an introduction to Epidemiology class this spring. My instructor, Dr. Kelly Kamm in the Kinesiology and Integrative Physiology department here at Tech, did her PhD dissertation on hand washing and the prevention of disease in young children. She talked to us about the importance of hand washing, especially around young kids who are at higher risk for diarrhea and pneumonia. These are two leading causes of death in children under 5. Most of the girls I work with in Ghana will be mothers one day, and so it will be important for them to know about what keeping their hands clean can mean for their young children. My name is Sonja Welch, and I’m going into my fourth year of Biomedical Engineering at Michigan Technological University. I’m from Baraga, MI, and I love reading, being in the outdoors, spending time with friends, staying active, and watching movies. 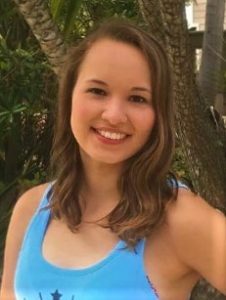 I’m a member of the Undergraduate Student Advisory Board within the Pavlis Honor’s College, the Vice President of Philanthropy for Delta Zeta, and the Fundraising Officer for Medlife. In addition to that, I also work in the Math Learning Center and the Engineered Biomaterials Lab. This summer, I’m going to be in charge of finding new projects in Ghana for future Pavlis cohorts. I plan to do this by facilitating Design Thinking Workshops, setting up meetings, and interviewing people in country. I will also be checking up on past projects, including the medical van, and working on finding new ways to make these facilities useful for the Ghanaian community. 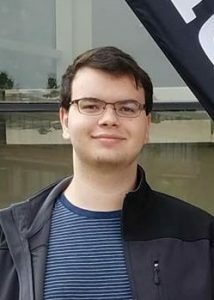 Hi, my name is Charles Fugate and I’ll be going into my third year at Michigan Tech this coming Fall. I’m currently majoring in Mechanical Engineering and Anthropology, with a minor in leadership. I enjoy exploring the Keweenaw, playing games with my friends, and listening to podcasts like 99% Invisible and Lore. I currently work as a Student Manager at the Memorial Union Building on campus, and will be a Multi-literacy Center Coach in the Fall. During our trip to Ghana during the summer I will be doing research into the folklore of the Akan people which will hopefully go into a repository that both Ghanaian’s and people on the internet can access, and that future cohorts can add to. 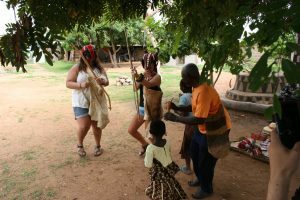 I look forward to setting up a project that I can really sink my teeth into, and that allows me to get an in-depth look at the cultural values and tradition of Ghanaians. Additionally, I hope this will open up new avenues for future social science based projects for future cohorts. I’m Josh Undlin, a 3rd year Mechanical Engineering Major with minors in Aerospace Engineering and Global Leadership. 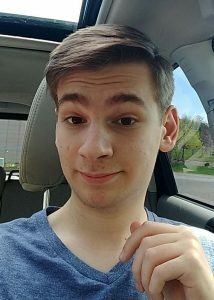 I’m from Canton, Michigan and plan on working in the aerospace industry after I graduate. When I’m not doing school work, I enjoy hanging out with friends, reading, and spending time in the outdoors. I’m a member of Michigan Tech’s Aerospace Enterprise and work as an Assistant Desk Coordinator at the reception desks on campus. Additionally, I’m a member of Mind Trekkers, an organization that travels around the country in an effort to get kids of all ages interested in careers in Science, Technology, Engineering, and Math (STEM) fields. I plan on using my Mind Trekkers experience in Ghana with my main project being working with schools in the city of Sunyani and the village of Babianaha to promote STEM education and encourage creativity in the classroom. I’m also leading the team in getting resources for the community center in Babianaha and identifying possible projects at this site for future cohorts. We Earlier this month we spent a weekend at McLain State Park with the Tanzania travel group, as well. We made some s’mores our second night, spent some time on the beach, and rediscovering our childhood at the playground. We also had a traditional Ghanaian dinner with our teaching assistant, Edzordzi. A photo of the four of us with our sparkling juice and dinner is below. The food is called “Banku ne nkrumakuan.” It has a tomato based soup with okra. Edzordzi said that in Ghana the okra would be fresh, but he used blended canned okra in the soup. 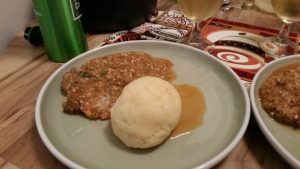 He made some salmon filets, and used Semolina to make the “bread like dough” that was representing Banku. You eat it with your hand (your right or “clean” hand), by pinching off some Banku and then scooping up some soup. During week 5, we spent our time with the extended family of our in country contact Emmanuel Opuni at their family compound in Babianeha. 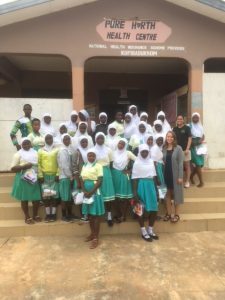 While staying with the family, the plan was to have two women’s health clinics, one in the local school, and the other at a government women’s health building along the Ghana-Côte d’Ivoire border, to have an engineering workshop at the local school, and to set up and teach community members how to use the Rachel Pi and Raspberry Pi’s in the community center that was built by a previous Pavlis team a few years ago. The focus of this blog post is on the Raspberry Pi’s. 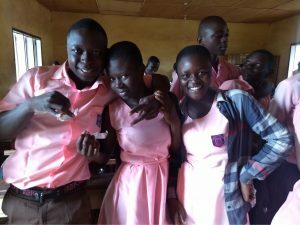 The project involved using the Rachel Pi as an offline repository of teaching videos, books, articles, and life skills exercises for the school kids and the community to use. 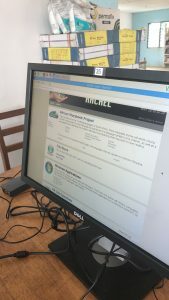 The Raspberry Pi’s were to be used as a means to access the Rachel Pi, and also supplement the netbooks that are already within the community center while allowing two more students to have a workstation they can use during ICT class. Due to the nature of the Raspberry PI project (project lead – Daniel), the ‘measure of success’ is mainly if the items work during setup, because it is up to the teachers how and when they integrate this tool into their teaching arsenal. It is our hope that the students can use the modules like Khan Academy Lite to reinforce things they learn in class like algebra and biology with informational videos and the little quizzes it provides. First off, the team apologizes for our lack of update over the last two weeks after a couple of hospital visits (a nasty fall ending in stitches and a not great reaction to anti malaria medication) projects had to be moved back which caused a hectic last two weeks. We joke with our in country advisor that we’re the most hospital visiting team he’s ever had. 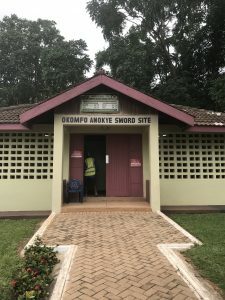 We’ll break this blog down with the Women’s Health project and the next with the Computer Literacy Project, the main two projects completed in the final two weeks of our journey. During Week 4 plans were finalized for everything in regards to the first Women’s Health Project. The original goal of having 5 different workshops didn’t look like it would be happening because of some communication issues with my in country contact but I was able to schedule one through my in country contact and another two with newly made contacts. Overall, the plan was to do one in Kumasi, Babianeha and right on the border of the Ivory Coast. All three workshops went extremely well and ranged in time from 45 minutes to 2 hours, depending on the size of the group. There were girls from ages 11-25 excited to learn about sustainable women’s health products and germs. I made sure to have an interpreter present to ensure the girls understand everything I said even though all their formal education is in English here. 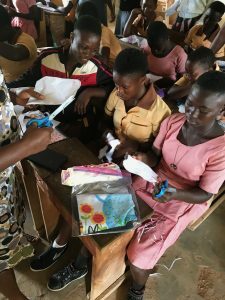 Each pack had 1 pre-made reusable pad donated from a church in the United States and enough materials to make two simpler reusable pads. As they were making their first pad and the interpreter and I walked around the room to assist them in the process and answer any questions they might have. I also had the opportunity to talk to them about what means they had used or knew of other girls using and some of the options were heart breaking and included things like an old towel or pieces of old mattresses. At the end of every session I asked the girls if what we made during the workshop was a better means of dealing with their monthly cycles and every time all the hands in the room went up to agree that it was. After the workshops some of the girls would come up to ask further questions about materials and other differences they could substitute into the process to make it easier, a lot of them couldn’t wait to go home and show all their female family members! It truly made it seem like this project had made such a significant difference in many girls lives. 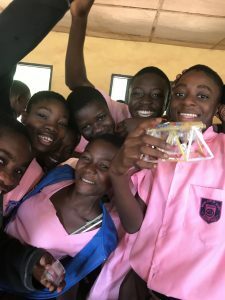 At the end of my time 200 packs were handed out to girls from Ghana and in the Ivory Coast and one group even had a special message to some of our supporters thanking them for their support! Unfortunately the file refuses to upload to look out for that in our overall video we’ll put together of our time in Ghana once we arrive back in the States. This week, we returned to Ridge Experimental School, the Sunyani Regional Hospital, and spent the weekend in Kumasi. At the Ridge Experimental School, we introduced engineering to a different group of students. The students had the same reaction as the first group; very excited, creative, and had a ton of fun. We did the same activity as last time. We separated the students into groups and gave them straws, tape, and scissors to build any type of bridge they wanted. We are very proud to have such an amazing response from the students! 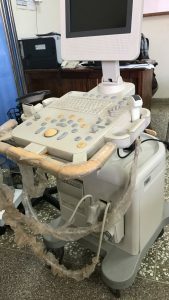 At the Sunyani Regional Hospital, we returned to check up on the beds in ICU and looked into a broken ultrasound machine. We ended up finding out that one of the capacitors on the power supply had blown. 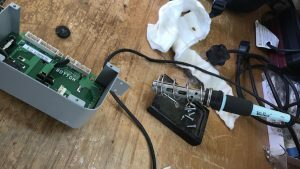 We unsoldered the broken component and are looking to replace it to get the ultrasound back up and running! Our trip to Kumasi was very successful. 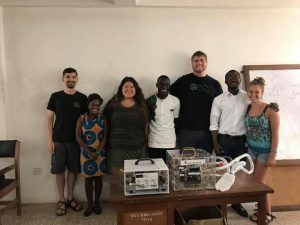 We were able to meet with our women’s health project contact to set up a women’s health workshop and we met with the engineers at KNUST working in collaboration with the IGS Enterprise at Michigan Tech on the ventilator. 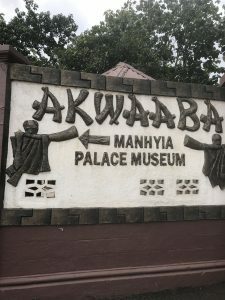 We also did a lot of souvenir shopping, went to a Ghanaian club and sung “Opps I Did It Again” for karaoke night, ate at KFC (yes, Kumasi has a Kentucky Fried Chicken! 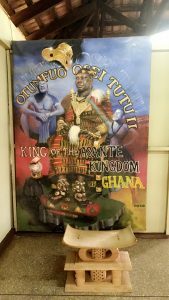 ), went to the new City Mall that opened in January, went to the Okomfo Anokye Sword Site Museum, and toured the Palace Museum were the King of the Asante Region lives!! The museums helped us learn a lot about the history of Ghana and we cannot wait to learn more! 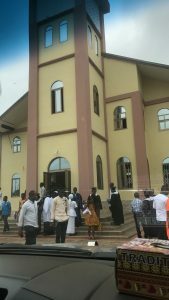 Upon our return to Sunyani, we had the opportunity to go to church with our in country advisor Emmanuel! Kids, Crocodiles, and the Hospital! Although week two started off with an unexpected Ghanaian holiday, (Republic Day was July 1st but Monday was the observed holiday) we have accomplished a lot. We started two of our projects which include introducing engineering to the students at Ridge Experimental School and working with Sunyani Regional Hospital to identify issues and take inventory of the medical devices that were not working properly. The goal of Engineering Education is to spark an engineering interest in the minds of Ghanaian students. Our first experience with this project, was working with the students at Ridge Experimental School. We started the class off with an ice breaker to loosen the students up by throwing around a balloon with questions on it. When they caught the balloon, they had to say their name and answer the question that their thumb landed on. The student smiled and laughed as we did this. We then asked the students engaging questions such as: Do you know what engineering is? Does anyone know an engineer? What do you know of that has been engineered? We gave them a simple definition of engineering: Working together to create/develop and improve ANYTHING! The activity we gave to the students was to build a bridge. We organized them into groups (6 groups of 10 students – yes, these classes are big) and gave each team straws, tape, and scissors. Now keep in mind that typical classes here are taught only through lectures, so this concept is new to them. Most students started grabbing at the materials right away, but we still showed them an example bridge to get them started. The students discussed designs with each other, worked together in determining who was going to build which part of the bridge, and then collaborated when they placed the pieces together – or they all worked on the bridge as one piece together. We were thrilled to see how well this was going – meaning that the students were having fun and being creative! It took all of the teams about 30-40 minutes to finish their bridges and when they were done, we introduced the design, build, and test procedure to them. We explained how they already designed and built the bridge, now they had to test it. We did this by calling each team up one-by-one to test to see if their bridge could hold weight. The students jumped around and cheered if the bridge held up or not – the amount of support between the students was amazing. We ended the class by telling the students that they can do anything if they put their minds to! We are very excited to work with many more classes and different schools! 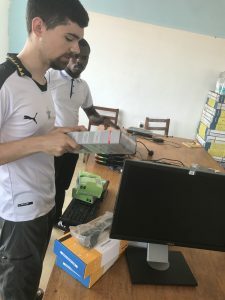 The goal of Medical Technological Servicing is to assist the engineers at Sunyani Regional Hospital by looking at the medical equipment that has not been working properly, downloading manuals of the equipments, and taking an inventory of parts they might not be able to get in Ghana. Our first task was to look at two x-ray machines in the radiology department that were not functioning properly. The first x-ray machine had a table that the locking mechanism did not engage properly. The second x-ray machine was an orthodontic x-ray machine that had its control remote dropped so many times that it was beyond repair. The next department we visited was the Laboratory in which a chemical micro-analyzer was not working. After going through the manual and looking at every inch of the machine, we cleared a communication error with the computer! After the machine was able to communicate with the computer, another error popped up that was a sensor error reading that the water tank was empty when it was not. 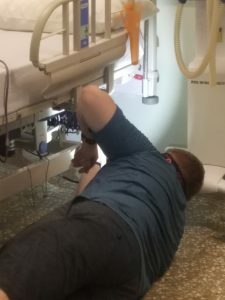 We went back later this week and visited the ICU (Intensive Care Unit) to try and diagnose the problems with a few of the beds there as they were not able to move up and down. After careful triage, we realized that one of the control arms was not attached to the motor underneath so we reconnected it and it worked perfectly! In addition, the ICU staff described that the beds did not work unless they were plugged into a wall. 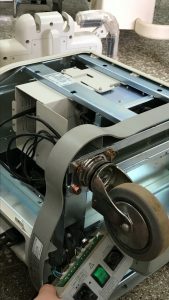 We were able to go into the battery and see that they were not connected properly. At the end of the day, we were able to fix both beds and the battery problem!! We can’t wait to continue our journey with the hospital! 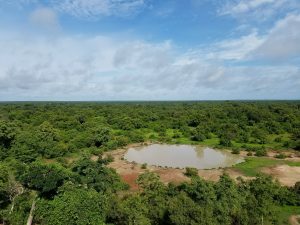 After a successful first week, we went to Mole National Park to go on a African Safari and we visited Paga to tour the Chief’s Crocodile Pond! 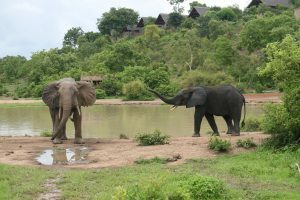 On the safari we got to see elephants, antelope, guinea fowl, a monitor lizard, kob (deer like), and monkeys! 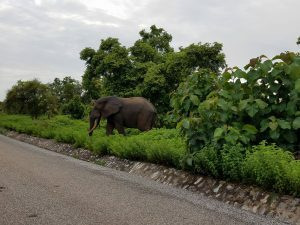 We got to get out of the vehicle to take pictures in front of the elephants! 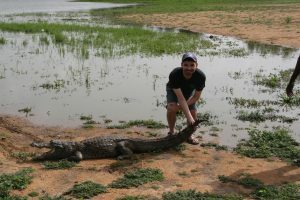 We spent the night at a hostel about 45 minutes south of Paga to refresh before seeing the crocodiles. At the crocodile pond, we got to take pictures sitting on the crocodile and holding the crocodile’s tail – the crocodile was cold, slimy, and hard! Bonus: we also got to tour the chief’s house as well as his compound. There we were able to climb on top of their roofs, dance with some children, and buy some souvenirs! Also on the way back to Sunyani, we briefly stopped at Pikworo Slave Camp where slaves were held until their final destination of Cape Coast. Auntie Cherie on Meet Your 2017 Ghana Team! 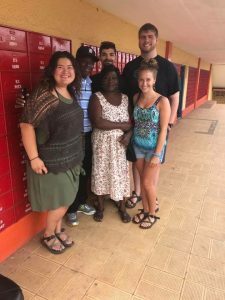 Gram and Gramps on Meet Your 2017 Ghana Team! 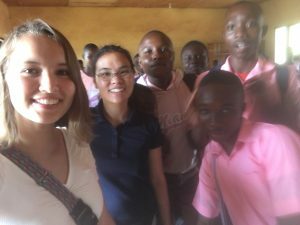 Nancy Misovich on Meet Your 2017 Ghana Team! 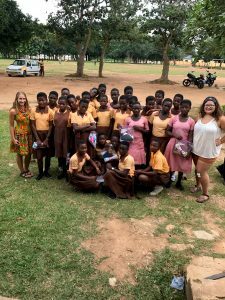 Martha Fauteux on Meet Your 2017 Ghana Team!